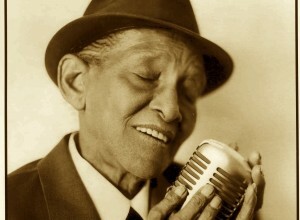 I can’t remember how I found out about Jimmy Scott, but I do remember it was right around the time I moved from New York City to Tulsa, Oklahoma in 2003, because I do remember gushing about him to the owner of the black-owned upscale bakery I began to frequent there. I was in my overt “connect across colorlines” phase after leaving the melting pot of NYC, and feeling like my world had gone white (you can read a little more about that on my About page). Wanda, the owner of the bakery, often had jazz playing when I visited her shop to take home some tasty treats–slices of turtle cheesecake, fruit tarts, or to order a cake for a special occasion. I told her and her son about the jazz singer, Jimmy Scott, and how he’s often mistaken for a female singer because of his high contralto voice. Sometimes called “Little Jimmy Scott,” his small stature and high-pitched singing voice were due to Scott having Kallmann’s syndrome, a very rare genetic disorder, which prevented him from ever reaching puberty. I brought Wanda in a copy of a Jimmy Scott CD I owned, and she appreciated the gesture, as much as I appreciated her energetic and kind manner, and her wonderful sweet delicacies. I missed her bakery after moving back East, and I have to admit, I haven’t listened to Jimmy Scott in quite some time. When I heard that he passed away two weeks ago at the age of 88, I knew I had to pay tribute to him here. Scott, who hailed from Cleveland, sang with many of the greats–Duke Ellington, Lionel Hampton, Charlie Parker, Sarah Vaughan, Wynton Marsalis, and Ray Charles. Snubbed early on by not getting credited on albums he sang on in the late 1940’s and early 1950’s, and even once having his recordings attributed to a female singer, Scott struggled for some time with getting his due recognition. In the 1960’s the career Scott was able to build, began to fade, and he returned to Cleveland where it’s said he worked for decades as an elevator operator, hospital orderly and shipping clerk. In the early 1990’s he sang at his friend, singer/songwriter, Doc Pomus’s funeral, and it was there that Scott’s magical talent was finally recognized once again, and he began to get a good deal of attention and recording and performing opportunities. Scott was still performing right up until the time of his death, on June 12th of this year. Here’s Scott singing, and talking about the importance of lyrics, in Time After Time. Hi, there, Wendy Jane! What a great blog post article and contribution which this is of yours! I love this! I’m so, so very much impressed with how you keep up with your superbly super blog and also respond to people’s comments. I can imagine if I were to have a blog that I couldn’t keep up so well. You do such a splendid job, my precious white friend and sister, Wendy Jane! You work so hard with a strong and beautiful effort-such a spectacular job! It is so hard to be able to write and put up blog posts and to always be able to reply-I so understand my friend and sister! Please don’t you be worried-I understand so well, Wendy Jane! You can only do so much-it isn’t feasible to do more. I understand, my very wonderful sisterfriend, Wendy Jane! I just love tis fabulous and fantastic blog post article of yours, as well as your other very marvelous ones! I have heard of the name Jimmy Scott but didn’t know about him. I didn’t know he was from Cleveland like I am as well! How in the world did I miss him and not really know of him but I think that I’ve heard of his name somehow. What a beautiful and soothing voice Jimmy Scott has. What very fine and excellent instrumentation and his great talk. I’m so glad Jimmy Scott finally got the very much overdue credit due to him. I wonder if I ever crossed paths with Jimmy Scott when I was still in Cleveland and just didn’t know it at the time. What a super talent he was! May he rest in Eternal Peace in our Heaven which awaits us! My precious white friend and sister, Wendy Jane, you have contributed quite a gem! I thank-you so, so much for this a whole bunch! The bakery owner, Wanda, and her tasty bakery with the delectable treats sound so wonderful, Wendy Jane! I got hungry just by reading about those delicious treats! You have lived in so, so many places around the country. I have only lived in Cleveland Heights, Ohio where I grew up, and I went to the University of Michigan at Ann Arbor as my first college but I withdrew from there in my junior year, then I finally went back to college at the age of forty at the University of Iowa at Iowa City in 2002 and I finally graduated from college at the age of 48 in 2010 as a Women’s Studies Major and I received my certificate in Sexuality Studies from the University of Iowa. I have only lived in Ohio, Ann Arbor, Michigan, and in Iowa. It is so very cool that you have lived in so many places, Wendy Jane! You have truly seen the country! I so love your beautiful and progressive blog post articles and all of your great contributions, Wendy Jane! I so, so love a whole lot your wonderful archives also! I am going to read through more of your marvelous and very interesting archives, Wendy Jane! Please have a very nice, special, relaxing, fun, and a very blessed Sunday, my special white friend and sister who you are, Wendy Jane! Thanks for reading, and listening:) And, thanks for understanding with the responses to comments. May be one day that I don’t respond to all comments, and let readers respond more to one another–start a dialogue with one another–that would be cool. I’m glad you enjoyed hearing more about Jimmy Scott-I forgot that it was Cleveland where you grew up. Maybe the two of you did cross paths at one time out there. :) I’m impressed that you graduated with a degree in Women’s Studies and hold a certificate in Sexuality Studies. It also took me a while to get my college degree. I had dropped out after my first year, and didn’t go back until I was 28. Whatever it takes–it’s never too late!